MOSCOW, November 26. /TASS/. An assault on the Russian embassy in Kiev overnight into November 26 was obnoxious and proved that radical Ukrainian nationalists and neo-Nazis control the situation in the country, Russian Foreign Minister Sergey Lavrov said on Monday. "It is radical nationalists and neo-Nazis who run the show in Ukraine, and yesterday’s obnoxious flare-throwing activity in front of the Russian embassy in Kiev is another proof of that," the Russian top diplomat pointed out. "Not that the police remained inactive, but they did not seem particularly willing to put an end to that mayhem," Lavrov noted. 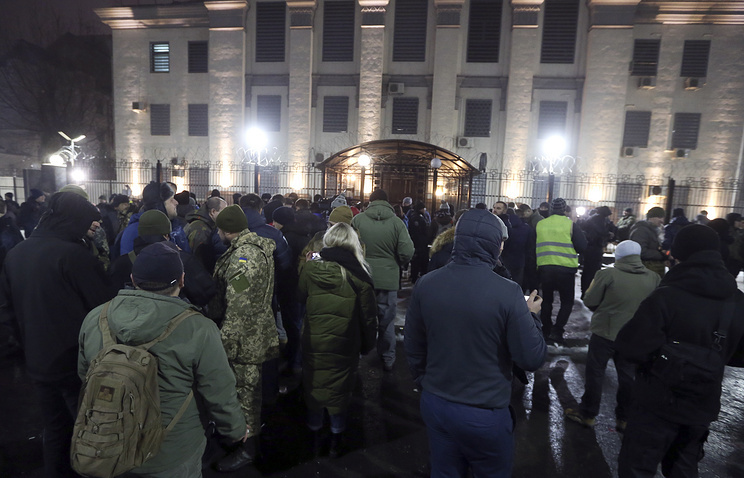 Following Kiev’s provocation in the Kerch Strait, Ukrainian radicals carried out activities in front of Russia’s diplomatic facilities overnight into November 26. They threw flares at the Russian embassy in the Ukrainian capital and burned tires in front of the consulate general in Lvov. In Kharkov, a group of extremists threw flares and eggs at the Russian consulate general.